Throughout your rehabilitation process, you may be prescribed different assistive devices to help you transfer, walk, and exercise. 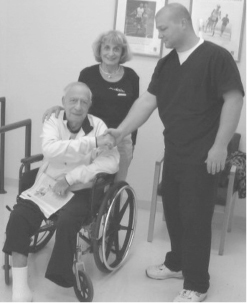 In the early stages following your amputation your therapist will begin training you to utilize various assistive devices to aid in walking. Some of the most commonly used devices may include the use of a wheelchair, walkers or crutches or a cane. It is common to start off with one device before you receive your temporary prosthesis. After receiving the temporary prosthesis, you may switch to something else. The situation is highly variable between different people. Your healthcare providers will discuss this with you. Similarly, you are encouraged to ask questions if you are unsure about which device is best for you, how to use it, and how long you will use it. Many people express a desire to walk without the use of any assistive device and many people with an amputation are able to accomplish this. Again, be sure to talk with your healthcare provider about what is realistic for you. Assistive devices are not only used for walking. Some specific activities such as driving require them as well. If your amputation involves the right side there are devices available that switch the pedals of your car to allow driving with the left foot. In the back of this booklet there are several organizations that offer assistance in obtaining these devices.